St. Boniface Cathedral Cemetery–fun not creepy! Cemeteries are creepy places. After all, they are filled with dead people. Once the sun goes down, there’s really no good or logical reason to be wandering these supernaturally mysterious grounds. 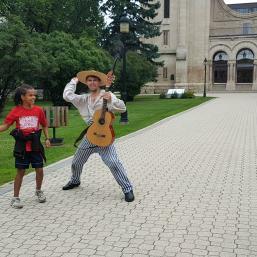 In fact, there’s hardly any reason to be there even at high noon…unless it’s a play, and in the St. Boniface Cathedral’s cemetery. 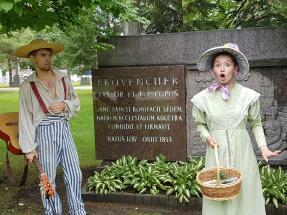 The cemetery at the St. Boniface Cathedral is the resting place of some of Manitoba’s best known sons and daughters. If you ever decide to take the In Louis Riel’s Footsteps tour ou bien, Sur les traces de Riel, that’s exactly where you’ll end up, and if I’m being quite honest, it’s an experience you’ll find so hilarious, you’ll forget that you’re actually in a cemetery…well, except for the fact that the play is centred on some of the key figures buried there. The play even called for some help from the audience. 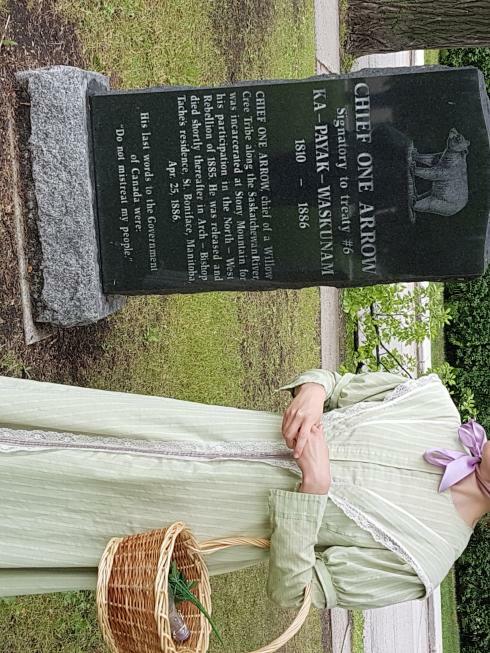 In Louis Riel’s Footsteps is a bilingual, guided walking tour that begins at the entrance of the St. Boniface Museum and takes you into the world of the St. Boniface cemetery’s dead; a fascinating world indeed, of men and women whose lives, love stories and legacies still impact the historical records some 200 years later. 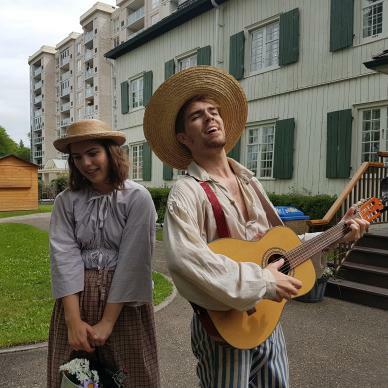 If you’re looking for a lighthearted lesson in French-Canadian and Métis history recounted partly in English and un peu en français, then this play promises lots of laughs and a wee bit of running that the entire family can enjoy. 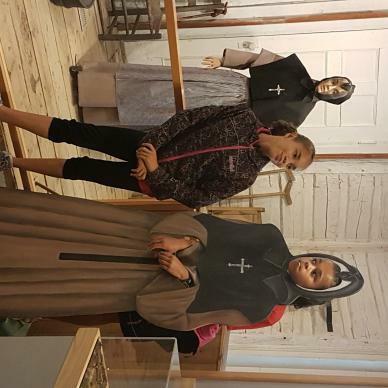 My nieces and I began our journey to the past within the walls of the St. Boniface Museum, wandering through the halls that were once a convent for nuns, catching glimpses into what life looked like in times past. Soon enough though, we had to cut our wandering short as it was time for the play to begin. 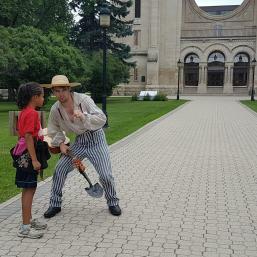 As we stepped outside and descended the stairway of the museum, we were greeted by Fanal the grave digger – and with a song no less – Gertrude, Fanal’s constant crush, and Western Canada’s first lay school teacher, Mademoiselle Angélique Nolin. Mademoiselle Angélique Nolin wearing one of her appalled looks. And so began our journey with a stroll from the museum to the cemetery and an introduction to some of its 6,000 inhabitants, like Métis leader and martyr Elzéar Goulet, Bishop Joseph-Norbert Provencher, Marie-Anne Gaboury the grandmother of Louis Riel and the first European woman to travel to and settle in Western Canada, Louis Riel’s right hand man, Chief One Arrow, and of course, the father of Manitoba himself, Louis Riel. As we were beckoned from tombstone to tombstone by the lively actors, each story was filled with humour à la Fanal and Gertrude, as la pauvre Mlle Nolin attempted to keep the historical facts straight and free of interruption by her companions who would often break into song and disappear only to return in the character costumes. 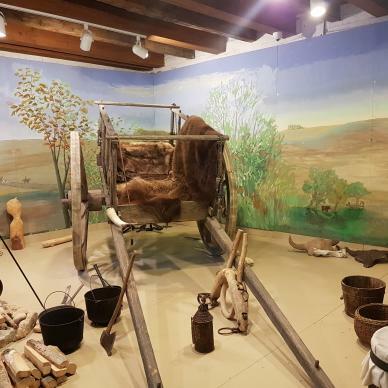 Perhaps the most unusual part of this play was its juxtaposition between more recent times and historical ones. 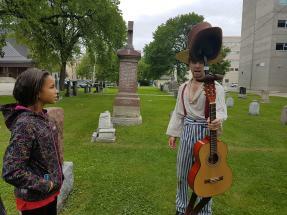 While one might expect a play set among the tombstones of men and women of the 1800s to reflect the music of its time, Fanal and Gertrude simply weren’t having it. 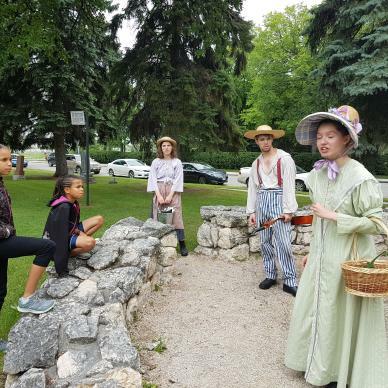 And so we were serenaded with likes of the Beatles and even some Whitney Houston, the result of which was an oft-appalled and apologetic Mlle Nolin. The cross between English and French throughout the play will likely appeal to anyone trying to gain a better grasp of the French language. The speed of the dialogue, at times, however, proved somewhat challenging for my nieces whose French is still in the budding stages. 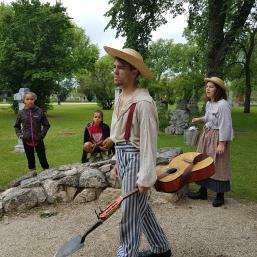 All in all, Sur les traces de Riel was a fun experience and a great way to learn about the province’s history…even in a cemetery. 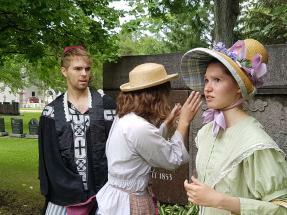 Theatre in the Cemetery happens every summer. Stay tuned for 2018 dates!